Servicing customers in the electronics industry, ProtoPak Engineering Corporation was approached to custom fabricate a packaging system for an electronics manufacturer. 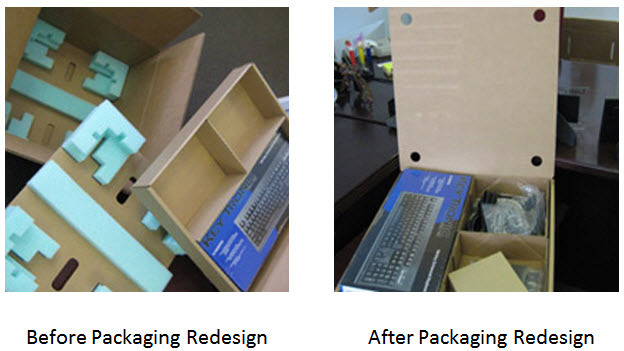 After assessing the client's needs we designed a packaging system that addressed all of their concerns. The cartons consisted of a slotted Kraft outer carton, and a three section internal foam packing set. The three inner sections had to be designed to allow for both easy insertion and removal of the delicate and expensive electronics that they would contain. Once designed, the prototype was put through rigorous testing; we subjected it to drop testing, vibration testing, and compression testing. After each trial the package passed with flying colors, the internal components undamaged and ready for use. To learn what ProtoPak Engineering Corporation can do for your company Contact Us Today. Have Client Review Design Prior to Mfg. Top: 32" x 32" x 8.25"
27.5" x 21.625" x 11.875"